Now there’s something you don’t see in a toilet every day! 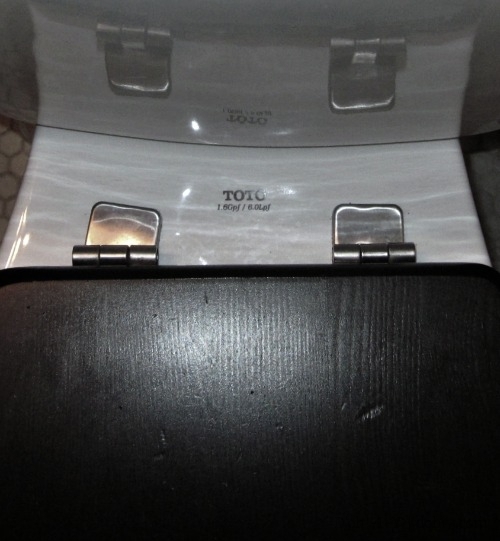 I had the idea to do a post about replacing a toilet seat. (Because I needed to replace a toilet seat. And people wonder where bloggers get their ideas!) But I was of two minds about it — I mean, talk about the World’s Shortest and Most Obvious Tutorial! When the new toilet seat arrived (from Amazon), I started the job, taking pictures along the way so I could decide later whether to post about it or not. You know how projects fall apart when you think they will be super-easy? If so, you probably won’t be surprised to hear that I started changing the seat on Wednesday, and until Friday afternoon, the toilet had NO SEAT WHATSOEVER. There are two basic types of toilets–round and elongated. 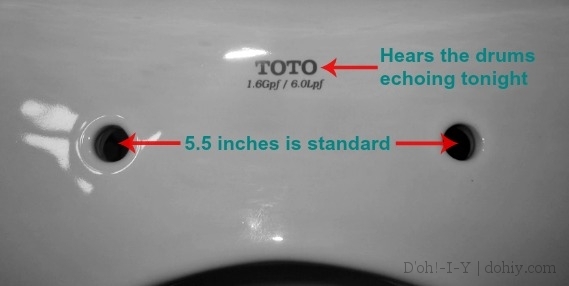 A round toilet’s bowl (UK: pan) is about 16 inches back to front, while an elongated one is about 18 inches. Our toilets are both round: small house, small bathrooms, small toilets. These two sizes are standardized enough that you only need to order a round or enlongated seat and it will fit (UK toilet seats are different, apparently). The bolt holes should always be 5.5 inches apart on center, but if you have an old or weird toilet, you might want to check that. That would be an enlongated seat. But it turns out that not every toilet seat is this easy, so I do have some useful information to offer the toilet-seat-changing community. The seat we had was an Ikea Freden. But when I removed it, I realized what the problem must have been. 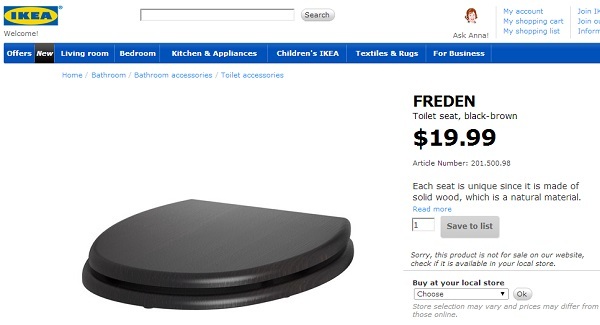 While most toilet seats have a tab that flips up to reveal a bolt head (as seen in the video), the Ikea seat just has the tab; the bolt doesn’t have a head, but is suspended by a flared end between two rails on the underside of the tab. The other thing with the Ikea seat is that the bolts are wicked-long. This must be so that you can hold onto the thing to be able to tighten it! If you get an Ikea seat, you should test-fit to see if you need to shorten up those crazy bolts. A long bolt pushing against a different part of the toilet could crack it. You don’t want that — it’s plumbing’s Humpty Dumpty. The headless bolt and the length make the installation (and removal) a tiny bit trickier than the standard routine shown in the video. 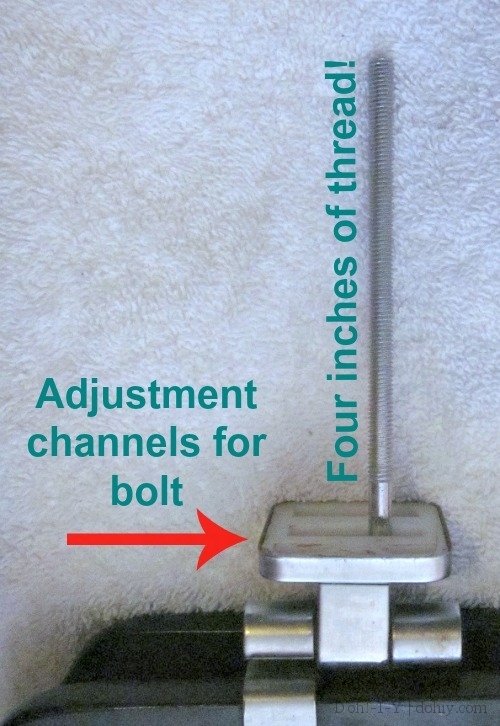 You can’t stabilize the bolt from above with a screwdriver. Instead, if installing, hold the bolt right underneath the bolt hole, and start screwing on the plastic nut. Once the nut is screwed on far enough to get past the end of the bolt, switch and hold on to the end while hand-tightening the plastic nut. 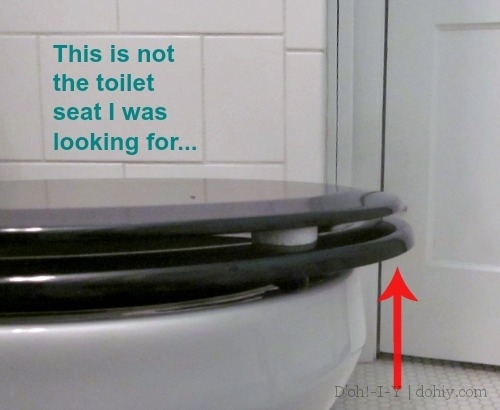 You don’t want to over-tighten a toilet seat anyway — like a long bolt, it can crack the porcelain. Ikea is probably not the only seat out there with these issues. Having said that, it was a very nice seat, as these things go. I mean, it did the job! It was just a bit knackered, especially from the Mayya cat skidding across it at great speed. I really wish I had that on video — now, she jumps up on the back of the toilet from the floor to beg me to turn on the sink. But she used to come charging into the bathroom, jump onto the toilet seat, fail to gain any traction…aaaaaand scrape her claws across the top in a last-ditch braking attempt, before finally falling off the other side. I thought I would die laughing the first four or five times it happened. The new toilet seat (on Amazon here, also available in white) also does not have tabs because it has a fancified metal hinge at the back. But the bolts are fixed rather than sliding as with the Ikea seat, so there was no need to stop the bolt spinning. There are some plastic spacers to help adjust this model for your toilet. They are useful, but also easy to drop into the toilet, I found out. After I took this picture, I realized that the seat was on just a tiny bit crooked. I fixed it but didn’t take another picture. How many pictures can you really take of your toilet anyway?? Judging by this post, four. Maybe five, tops. 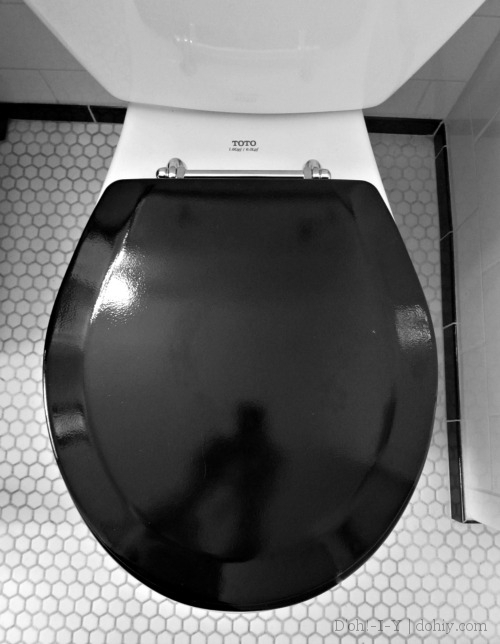 This entry was posted in American vs English, Bathroom, D'oh!, Plumbing and tagged black toilet seats, ikea toilet seat review, installing an ikea toilet seat, replacing a toilet seat, replacing a toilet seat without bolt heads, round vs elongated toilet seats. Bookmark the permalink. This is a throne to be proud of. Shiny and new being criteria. However, would be curious to know if Maya cat has continued to practice toilet seat Olympics or if she has totally given up and gone for the big vertical leap altogether. It’s mostly big vertical leap now. She will sometimes bounce from the toilet seat, but she learned not to take a running start at it!